New Zealand are sticking with the same team, and the same fearless approach, for Sunday’s World Cup final against Australia at the Melbourne Cricket Ground. New Zealand captain Brendon McCullum said the Black Caps would use the same lineup that beat South Africa in the semi-finals and the same bold tactics that have served them so well during the tournament. Showing no signs of nerves or apprehension ahead of the biggest match in New Zealand cricket history, McCullum said his players had been told to go out and attack the Australians from the start. “We need to play like that, that’s how we’re going to beat teams on regular occasions,” McCullum told a news conference. “We’re not afraid of losing. “For us, we think about what we can achieve. That’s not always going to work and there are going to be times when we come out on the wrong side of it. But that gives us our greatest chance of success against big opposition teams on a regular basis. New Zealand’s intimidating approach to the game has paid off during the World Cup. With the dashing McCullum laying the foundations at the top of the order, the Black Caps have been piling on the runs with the bat and skittling opposing lineups with their fast bowlers. They have also shown they can handle pressure, beating Australia in a tight match during the group stage and South Africa in the semi-finals. 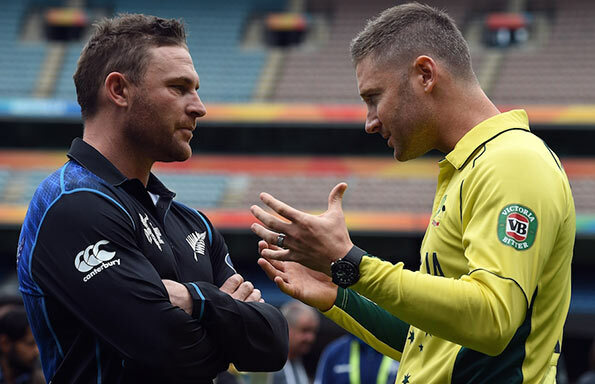 Now, McCullum says, his team have to make sure they do not freeze in the final. “I’m confident we’ll play well tomorrow,” he said. “That doesn’t guarantee us anything, it doesn’t mean that Australia won’t beat us, but I’m very confident we’ll turn up and display our skills just as we have done throughout the tournament. “I guess this is the ultimate game for us to be able to play in, so with that I’m sure some guys will be nervous. McCullum conceded that four times champions Australia were the favourites on home soil but said his team mates were aware this was the chance of a lifetime. “It’s pretty amazing, the ride we’ve been on, and I’ve said that time and time again that it’s been the greatest time of our lives,” he added. “We dreamed right from the start and to now give ourselves a 50-50 chance in the final is an amazing achievement. “The brand of cricket that we’ve played has really touched a lot of people and endeared ourselves to a lot of people who follow this game. Well, NZ scored 188 and I am sure Auz will get WC for the 5th time.